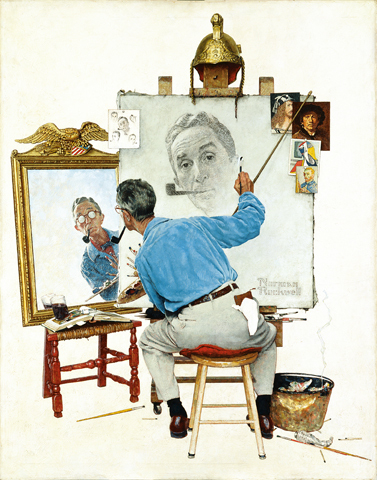 Norman Rockwell (1894-1978), Triple Self-Portrait, 1959. Oil on canvas, 44 ½” x 34 1/3″. Cover illustration for The Saturday Evening Post, February 13, 1960. Stockbridge, MA, August 7, 2017—Norman Rockwell Museum will present the lecture “Coming of Age: American Portraits from Copley to Warhol” with art historian Maureen Hickey on Thursday, August 10, starting at 5:30 p.m. Ms. Hickey will explore the ways in which portraits have revealed the political, religious, and social status of their sitters, as well as the aesthetic preferences of their era. Presented as part of the Museum’s ongoing Inventing America: Art and Cultural Connections series, the talk will look at such early American artists as Rembrandt Peale, Benjamin West, and Gilbert Stuart; nineteenth century masters John Singer Sargent, Thomas Eakins, and Winslow Homer; Ashcan painters John Sloan, Robert Henri, and George Bellows; and the culture of celebrity inspired by Andy Warhol, whose art is currently on view. The talk is free for Museum members, or included with Museum admission.